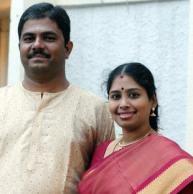 Husband of popular carnatic vocalist Nithyashree, Mr. Mahadevan committed suicide early in the morning by jumping into the Adyar River. His body has been recovered by the police but the exact reasons for his suicide are yet to be known. Investigations are underway and the autopsy happened at the Royapettah Government hospital. Mahadevan was 45 while Nithyashree is 39. The couple has two daughters as well. This incident has come as an extreme shock for the entire music fraternity as Nithyashree is an extremely popular name in carnatic as well as film music circles. She has sung evergreen hit numbers for A.R.Rahman such as Kannodu Kanbadhellam, Sowkiyama and many more. It must be noted that the annual December Carnatic Music Festival is currently underway in Chennai across various sabhas and halls. Behindwoods offers its heartfelt condolences to the ace singer in this time of grief.